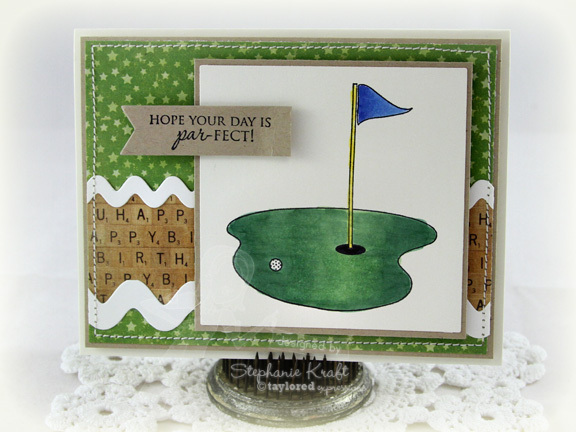 HandKrafted by Stephanie: Hope Your Day is Par-fect! Hope Your Day is Par-fect! Hello! Today I have a masculine card using some Taylored Expressions goodies. My image is from Boys Will Be Boys. I stamped and colored the putting green with Copic markers. I added a couple of strips of ric rac (using the Ric Rac Borders) and added my sentiment on the smallest Banner Stacklets 1. Everything is up on foam tape. Accessories: Taylored Dies: Banner Stacklets 1, Ric Rac Borders (Taylored Expressions), Markers (Copic), Foam tape, Thread, Sewing machine. Love this one, Stephanie! Those letter tiles peeking from behind the panel looks awesome! Adorable card, Stephanie! Love the scrabble looking DP! The white ric rac is also a nice, bright, element, love it! Fun card Stephanie! Par-fect for a golfing friend! Love the ric rac trimming! So cute Stephanie! Love that happy birthday paper in the background - your card is just par-fect!!! xoxo!